By using Terminal Services Manager, you can see the details of the users connected to a remote host, their sessions, and their active processes. For several hosts simultaneously, you can monitor each user, session, and process's usage of remote host resources (CPU, memory, etc.) in real-time. Using Terminal Services Manager, you can easily perform a variety of administrative tasks to manage resources and users on a remote host, for example, disconnecting all inactive users, closing inactive users' sessions, or terminating a remote host process. 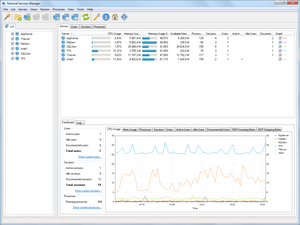 The quick and easy way to monitor and manage remote host resource usage! With Remote Desktop Audit, you can use the unified dashboard to analyze remote desktop access to your servers and then aggregate or filter the results by time, server, username, or IP address. In addition to convenient tracking of logon and logoff events, Remote Desktop Audit provides efficient tools for data analysis, data export, and reporting. Find out who has been accessing your servers via remote desktop! 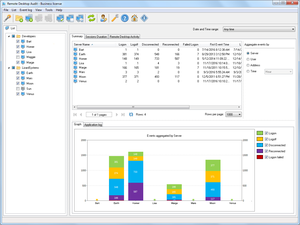 Remote Process Explorer is a powerful tool for managing, monitoring and analyzing processes on a local or remote computer. You can use Remote Process Explorer not only to get the list of processes running on a remote or local computer, but also to run a new a process, kill it or change its priority. 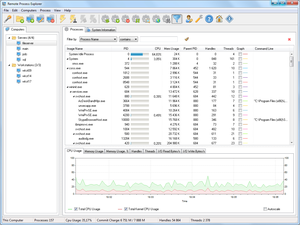 In real time, Remote Process Explorer monitors the performance of a remote computer, by showing the number of processes running as well as the amount of CPU, memory and other system resources it uses. Moreover, it will also show hidden processes which will allow you to detect spyware and malware. Remote Process Explorer is an easy-to-use solution for managing processes on a remote computer! We are pleased to announce that a Find MAC Address 6.4 and Change MAC Address 3.3 are available for downloading. Added Polish language. Number of recognized network card vendors is increased to 25 531.